PONTE VEDRA BEACH, Fla. – The Champions Tour and the Desert Mountain Club announced today that its season-ending event, the Charles Schwab Cup Championship, will be hosted next year by the Desert Mountain Club in Scottsdale, Arizona. The Cochise Course, one of six at the facility designed by golf legend Jack Nicklaus, will be the venue for the championship. The top-30 players on the Champions Tour money-list at the conclusion of the 2012 season are eligible to compete in the limited-field event, to be played October 29 – November 4, 2012. Built in 1987, the 7,019 yard Cochise Course was the host venue for The Tradition, one of five major championships on the Champions Tour, for 13 consecutive years from 1989 to 2001. During that period, the Cochise Course was voted by Champions Tour professionals as the “Best Maintained Golf Course” on Tour and was consistently ranked in the national golf magazines’ top-100 lists. Desert Mountain offers its members six private Jack Nicklaus Signature Golf Courses, the most in one location anywhere in the world. 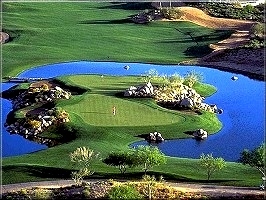 The Cochise Course features rolling fairways surrounded by water and desert rock outcroppings. The hallmark of the course is the par-3 seventh hole and par-5 fifteenth hole where the double green for these two holes sits on a picturesque island, approached from two different directions. “Cochise is a great example of the variety of golf the members at Desert Mountain get to enjoy and among the reasons the club is so unique. It was a challenge to do six different golf courses on six different properties, and I believe we did a good job in creating courses and golf experiences that play in diverse ways. Of the six distinctive design approaches, Geronimo and Cochise were meant to be golf parks, with the sportier course being Cochise. Variety is the beauty of the overall golf experience there. I have said before, you would be hard-pressed to find a better golf complex in the world than Desert Mountain.” Visit Nicklaus Design at www.nicklaus.com and read the Cochise Course Overview. John Cook is the two-time defending champion of the Charles Schwab Cup Championship, winning at Sonoma Golf Club in 2009 and TPC Harding Park last year. Cook is seeking to become the first player in Champions Tour history to win the event three consecutive years. The complete Champions Tour schedule for the 2012 season is expected to be finalized later this year, visit www.pgatour.com.